Without theft, there is no pop, but it’s still rather squirmsome to hear the more lumbering attempts. 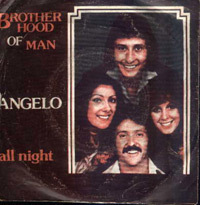 Brotherhood of Man’s – let’s be generous – tribute to ABBA fails partly because it doesn’t stick closely ENOUGH to its source material. ABBA records gain what emotional power they have from the force of the melody and performance letting you fill in what the lyrics miss out. So “Fernando”, a record the Brotherhood might possibly have heard when working on “Angelo”, works because the melody creates the regret the lyrics deny, and because the background to this strained campfire conversation is hinted at but never crystallised. “Angelo”, on the other hand, has no truck with such subtleties, preferring to spell out the tragic fate of shepherd boy Angelo at the same time as hammering it home with the music. To be fair to the Brotherhood, it’s not like most death ballads don’t take this Donald-ate-the-pie* approach to storytelling. A death song pastiche of “Fernando” should more properly be something along the lines of “Ode To Billie Joe” or the Shangri-La’s “Past, Present And Future”, where it’s obvious that something apalling and unspoken is happening in the background but it’s fearfully unclear what. Both those songs are, not by coincidence, amazing. “Angelo” is not. At no point during the progress of the record do I care about Angelo, or his chick, and I don’t get any sense of place or personality or stake or anything at all, in fact the only thing in the lyric to remark on is that awkward slip into Yodaspeak in one of the verses: “Rich was she”, a clumsy shoehorn which seems to sum up the whole record. For all that, I wouldn’t call “Angelo” actually bad. Its slipshod laziness is still a hundred times preferable to “Save All Your Kisses For Me”, and at least you get to cheer as Angelo pops his clogs. Also, by luck or study, the Brotherhood have hit on a belter of a chorus, with the “They took their LIVES that NIGHT” section as rousing an imitation of ABBA as you’ll find in the late 70s: at that moment “Angelo” seizes some kind of momentum, which it quickly squanders, but there’s still enough hook behind the clumsiness to stop me really disliking this. *A brief explanation of Donald-ate-the-pie: this useful critical concept was introduced to me by the Dirty Vicar, and comes from a Mickey Mouse cartoon strip. Panel one shows a pie, baked by Mickey. Panel two shows Mickey’s distress as he discovers his pie has vanished. Panel three shows Donald Duck, with his long neck distorted by the unmistakable shape of a pie. Panel four shows Mickey saying “IT WAS DONALD. HE ATE THE PIE.” So it springs to mind whenever I come across exposition that is not only ungainly but actively undermines previously achieved neatness. It actually isn’t at all applicable to “Angelo”, then, which never goes anywhere near neatness, but the concept is more fun than the song really. So, that makes two Number Ones out of the last three for the seemingly unstoppable Clem Cattini, even though his reign was fast approaching its end. At the time, I loathed “Angelo” so deeply that my loathing became perversely enjoyable. The way that BOM couldn’t even be bothered to finish the song properly particularly grated; for after the first verse and chorus, there are literally no more lyrical or musical ideas to be found, are there? Re. #4: BOM’s TOTP “whoopsy” moment came with their previous hit “Oh Boy (The Mood I’m In)”. The record stuck, you see. This must have scarred BOM horribly, as the song doesn’t feature in their live set any more – having been booted out in favour of a “Seventies Medley” which includes a particularly hellish segue from “Remember You’re A Womble” into “My Ding-A-Ling”. No doubt climaxing with a modern song to show that they’re still “with it” – perhaps the Babelfished standard known as “They Create From Top” (to avert SB gimlet eye). No, it’s sadder than that. They leave the stage, and then a tape announces them as “Ladies and gentleman, the winners of this year’s Eurovision Song Contest are…!” (or words to that effect), as if it were 1976 all over again – at which they bound back on, changed into replicas of those self-same 1976 costumes. Replaying their one moment of continent-straddling victory, night after night, decade after decade, to ever-dwindling audiences on the Butlins circuit… so bleak, so bleak! And I thought David Van Day had it bad with the Brighton burger van deal! Oh dearie, dearie me, that IS sad. Or at least it would be if they didn’t also supplement their income by playing at Tory Party conferences. Live by the free market, die by the free market, eh? You know, I never thought David Burger Van Day was a sad thing (funny, yes, but not sad): Good for him, not being too ‘big’ to do it. The scenario above re the BOM’s reliving the victory is way sadder. will live with me frevr. If only DVD hadn’t cancelled out his sadness by (unsuccessfully) standing for election as a Tory councillor, not to mention all the Real Bucks Fizz hi-jinks. When I saw BOM last year, they were supporting Bucks Fizz – not the still operational all-star Mike Nolan / Dame Cheryl of Baker / Shelley Preston version, but the Bobby Gee + his missus + two randoms version. Oh, what a night. In the interests of objectivity I have forced myself to listen to every single number one several times, intently listening to the lyrics (something I didn’t probably do that much before). Sometimes it’s a pleasure, revealing elements I had never picked up before and sometimes….sometimes I wish I hadn’t started. Angelo, as I now fully realise is a death disc. A very bad one. Anyone who ventured out to buy this and pay actual money for it (and there must have been quite a few of them) has serious issues. I note from the above that they are still touring – one question comes to mind – why ? Even spent Eurovision winners have to pay the bills! 5 is super-generous. It’s weird how ITV this sounds after Oh Boy (The Mood I’m In). This was also “inspired” by Abba – after all, the guy with the ‘tache had been BOM’s lead singer before the Swedish chart takeover led the girls to give it a go – but was a very decent 45 with a lyric about an abandoned mother and child, quietly desperate, with all the pathos that Angelo and his overripe saga singularly lack: “I would comb every home, every neighbourhood bar, I would ride every greyhound or railroad car”. Mystery, too – why’d he walk out on such a warm and cosy family? “He haunts my mind and wracks my brain.” Really, it’s worthy of Abba. BTW Angelo and four of the no.1s around it ended up on K-Tel’s Disco Fever. Someone did a good licensing job there. Also includes “phantom” no.1 Magic Fly and the RAH Band’s nasty (in the best way) synth-glam instrumental The Crunch – which sounds quite intensely NOW! Well, I’ve got Earl Brutus on my mind. I too have Disco Fever though the inclusion of “The Crunch” in particular is marred by the “some tracks have been edited” proviso. Happily it is now properly available on the CD reissue of the Crunch And Beyond album. Another Disco Fever owner here. Didn’t buy it at the time, but a copy was left behind in the flat that we moved into in 1985, along with a copy of Don’t Walk, Boogie. I’m a freak, I loved it then, and thinking about it now, I still do…mind you, when I sang it to my daughter, she pe’d herelf at the lyrics…ah the rap generation have no taste!!!! I love the Barron Knights’ version, and it scores over the original in one significant aspect. “Running away together, running away forever, Angelo” always jarred with me – Together? Angelo *and who*, then? If it’s “together” it doesn’t make sense not to give the young lady a namecheck too. Dawn French also passed this test when, on “Girls on Top” (1985) her character Amanda, thinking she was onto a winner with love interest Tom, sang the line to herself in the kitchen as “Running away together, running away forever, Tom and Amanda.” Wonder if ITV had to pay the writers of Angelo royalties? Just heard this for the first time and, yes, 5 does seem like the perfect score as the song is equal parts 10 (insanely catchy) and 1 (spectacularly tasteless and clunky to boot). It would be perfect as the theme tune to a Belle & Sebastian – style cartoon about the couple’s adventures on the run – but then they have to spoil it all with the suicide, which adds nothing to the story and jarrs with the cheerful way they’re singing about it. Does this mark the end point of the ‘romantic death’ trope? I hope it does.